Women aged 30 years and older who had been admitted to Tepecik Education and Research Hospital in İzmir province for routine cervical cancer screening between June 2012 and December 2014 were enrolled to the study. Cervical swab samples were collected for HPV-DNA examination. For identifying HPV genotypes, cervical samples were analyzed by Cobas® 4800 HPV Test qualitative real-time PCR system (Roche Molecular Systems Inc., Alameda, CA, USA) for HPV types 16, 18 and the other 12 high risk HPV (hrHPV) types (31, 33, 35, 39, 45, 51, 52, 56, 58, 59, 66, 68). In this study, the overall HPV positivity was detected in 10.07% (539/5350 samples) of women during routine cervical cancer screening. Of these, high risk HPV was detected in 539 (10.07%) samples HPV type 16 was detected in 187 samples (31.59%), HPV type 18 in 46 samples (7.77%), and other hrHPV (pool of 12 genotypes) in 359 samples (60.64%), either as single or multiple infections combined. Of 539 HPV positive samples, 489 (90.72%) were single type HPV infections and the remainder (n=50, 9.28%) were multiple type infections. There was no significant difference in HPV prevalence by decades of life. Our results showed that hrHPV types other than type 16 or type 18 are the most detected genotypes in women undergoing routine cervical cancer screening. Data of the heterogeneity in HPV type distribution must be taken into account for the decision of vaccination and screening modalities. Cervical cancer is the second most common cancer among women worldwide . Persistent infections with carcinogenic Human papillomavirus (HPV) types are well-recognized causes of cervical cancers. More than 100 different HPV types have been identified, and genotypes 16, 18, 31, 33, 34, 35, 39, 45, 51, 52, 56, 58, 59, 66, 68 and 70 are associated with the development of cervical intraepithelial neoplasia grade 2, or 3 and invasive cervical cancer and these genotypes have been classified as high-risk group . Thus, HPV genotype detection is helpful procedure in reducing cervicalcancer incidence . Despite the association of HPV infection in carcinogenesis has been extensively studied worldwide, limited data are available on HPV genotype distribution, prevalence, or associated cervical diseases in especially economically undeveloped countries. Since the vaccines have been developed to reduce the global burden of HPV related diseases, determining the distribution of HPV genotypes is crucial for implementation of vaccines . In consequence of the lack of reliable data on the distribution of HPV types among Turkish women, in the current study we aimed to investigate the high risk types of HPV in cervical cytology specimens of women aged older than 30 years and to identify the distribution according to the ages of the patients. Women aged 30 years and older who had been admitted to Tepecik Education and Research Hospital in İzmir province, Western Turkey, for routine cervical cancer screening between June 2012 and December 2014 were enrolled to the study. Women with a known diagnosis of cervical cancer, immunosuppression, HPV vaccination, or referral for an abnormal cervical sample were excluded. Cervical swab samples were collected for HPV-DNA examination. For identifying HPV genotypes, cervical samples were analyzed by Cobas® 4800 HPV Test qualitative real-time PCR system (Roche Molecular Systems Inc.,Alameda, CA, USA) for HPV types 16, 18 and the other 12 high risk HPV (hrHPV) types (31, 33, 35, 39, 45, 51, 52, 56, 58, 59, 66, 68). The Cobas® 4800 HPV test was performed according to the recommendations of the manufacturer . Detection of HPV types in cervical samples was considered as positive or negative. A total of 5350 cervical samples were analyzed for HPV-DNA during routine cervical cancer screening. Of these, high risk HPV was detected in 539 (10.07%) samples (Table 1). HPV type 16 was detected in 187 samples (31.59%), HPV type 18 in 46 samples (7.77%), and other hrHPV (pool of 12 genotypes) in 359 samples (60.64%), either as single or multiple infections combined (Table 2). Table 1. Human papillomavirus positivity rates in the cervical cytological samples. Table 2. The frequencies of HPV types (either as single or multiple infections combined). Of 539 HPV positive samples, 489 (90.72%) were single type HPV infections and the remainder (n=50, 9.28%) were multiple type infections. Other hrHPV types were the most prevalent in both single (314/489 samples, 64.21%) and in multiple infections (45/50 samples, 90%). In single infections, HPV 16 was detected in 147 samples (27.27%), whereas HPV 18 samples in 28 (5.19%). 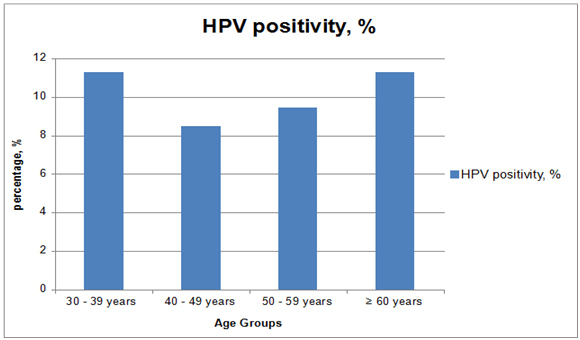 Table 3 shows the distribution of single and multiple HPV types in age groups by decades. Table 3. Proportion of Human papillomavirus types (either single or multiple infections combined) in age groups by decades. The average age was 37.5 years (30 years - 82 years). The prevalence of HPV positivity according to ages was as follows: 11.30% (299/2645 samples) for women between 30–39 years; 8.47% (163/1924 samples) for women between 40–49 years; 9.46% (58/613 samples) for women between 50–59 years; and 11.30% (19/168 samples) for women over 60 years (Figure 1). Figure 1. High risk Human papillomavirus prevalence in age groups by decades. Data of the HPV prevalence and type distribution in a population is crucial on decision of vaccination and treatment strategies. In this study, the overall HPV positivity was detected in 10.07% (539/5350 samples) of women during routine cervical cancer screening. This positivity rates are similar to the global prevalence of HPV infection in women with normal cervical cytology which is estimated to be 10.4% . In Turkey, several studies have been carried out to evaluate the genotype distribution [7-15]. According to these studies, HPV prevalence rates change from 4.9% to 57.5%. The divergent results of the prevalence may be attributed to the different detecting methods and the study groups. Most of the data are based on the hospital based studies, thus, reliable data on HPV type distribution in Turkey is still lacking. In the current study, 12 hrHPV types other than type 16 and type 18 are the most prevalent types. The prevalence of HPV type 16 and HPV type 18 were 31.59% and 7.77% respectively. This data is similar with the other studies especially conducted in cytological normal Turkish women. In a largest hospital based study conducted in Turkey, HPV type 16 and type 18 prevalence was reported 32% and 8% respectively . Batmaz and et al. showed that HPV type 16 rates were 18.6% and type 18 was 10.0% in women with normal cervical cytology. Akcali and et al. reported the HPV type 16 prevalence as 28.5%, and type 18 prevalence as 2.8%. Tezcan and et al. showed that HPV type 66 was the most frequent type (22.6%), and the rate of HPV type 16 was 20.8%. Distribution of the HPV genotypes varies in these studies according to the selected study population. But, according to these studies in women with normal cervical cytology conducted in Turkey, the cumulative rates of HPV types other than type 16 or type 18 are more common as also shown in our study. Similarly, total hrHPV types other than type 16 and type 18 were more common in the studies from Egypt and Kingdom of Bahrain [16,17]. In a meta-analysis, the HPV types 16 and 18 are most commonly described in pre-neoplastic and cancer cases, although the relative contribution of HPV type 16 and HPV type 18 is substantially lower in cytologically normal women . The rates of HPV prevalence are highest in women younger than 35 years of age and usually decline in older ages in many populations . But in our study, there was no significant difference in HPV prevalence by decades of life. Similarly, this age independent pattern was previously reported in several developing countries and in one report from Turkey [19,20]. In this study, we must emphasize that we do not know the more common genotypes in the group of other 12 hrHPV. According to the higher prevalence of other hrHPV types, determining the genotype predominance would help us to include the other genotypes in new generation vaccines and also in new molecular diagnostic tools . In conclusion, data of the heterogeneity in HPV type distribution should be taken into account for the decision of vaccination and screening modalities. For this purpose, population-based studies must be carried out in Turkey. Although HPV type 16 is known to be the most prevalent type worldwide, our results showed that hrHPV types other than type 16 or type 18 are the most detected genotypes in women undergoing routine cervical cancer screening. Thus, detecting the other types of HPV is reasonable in screening of cervical cancer. Also, to establish the HPV types by the multi-central studies is important to determine the HPV genotype prevalence in Turkish population. Cobas 4800 HPV Test (package insert). Branchburg, NJ, USA: Roche Molecular Systems. Yildirim D, Yildirim ME, Bakici MZ (2013) Human papillomavirus positivity and frequency of genotypes in servical samples of women living in Sivas Region. Firat Med J 18: 94-97. Batmaz G, Cetin A, Dane C, Gorgen H, Dane B (2009) HPV DNA positivity in women with normal and abnormal cervical smears. Turk J Gynecol Oncol 1: 10-14. ©2015 Bayram A. This is an open-access article distributed under the terms of the Creative Commons Attribution License, which permits unrestricted use, distribution, and reproduction in any medium, provided the original author and source are credited. Department of Microbiology Laboratory, Tepecik Educational and Research Hospital, Izmir, Turkey, Tel:+90-232-4696969; Fax:+90-232-4330756.